Lark Toys is a family business in Minnesota. Lark Toys owners Ron and Kathy Gray (standing), their daughter Miranda (seated) and son-in-law Scott Gray-Burlingame, granddaughter Gwendolyn (Wynnie), age 12, and grandson Murdock, age 2. Toy maker Tim Monson (and his helpers) usually make the pieces needed for each style in groups of 20 to 30, which takes about two days to complete. To be sure of getting the best quality wood, Monson goes to a local lumberyard and picks what he wants. The stains are mixed by a local provider to be both child-safe and beautiful. “Since we are a family business, we all do whatever needs doing,” says Kathy. Kathy Gray runs Lark Toys alongside her husband, daughter and son-in-law. Here she shares the backstory on their business and guiding philosophies. How did Lark Toys begin? Kathy: Lark Toys has been in existence for 30 years. 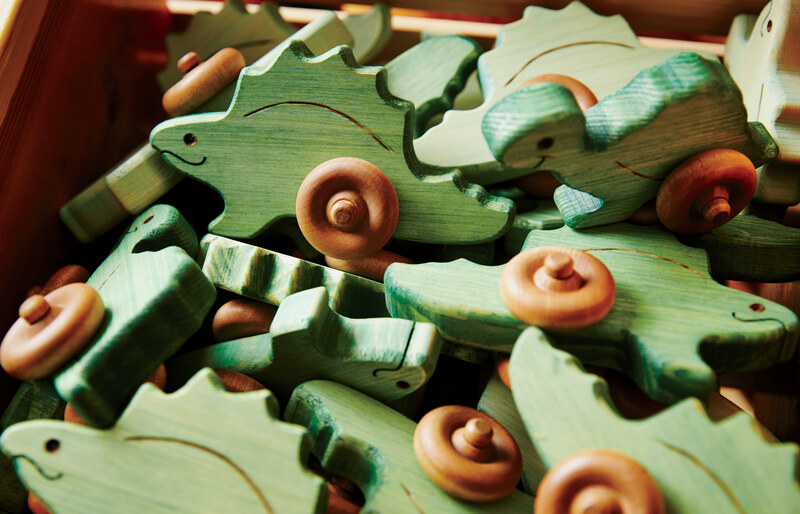 It was started by Donn and Sarah Kreofsky, a couple of teachers who liked making pull toys for their kids. They started selling the pieces at art fairs, and then they opened their own factory. How did your family get involved? About eight years ago, the Kreofskys were looking for a family to take over, and we were a family looking for a business. It’s me, my husband Ron, our daughter Miranda and son-in-law Scott. We didn’t have a ton of money, so it took a little while to figure out, but eventually we managed it. We loved the fact that the original toy maker was still working at Lark Toys. Did your family already have experience making toys? We actually have a pretty crazy variety of experience among us—my husband Ron and I owned a gift-making business. Ron was also a youth pastor, my son-in-law is an artist who has led wilderness trips, and my daughter and I are both licensed in hypnotherapy. Above all, we are all very entrepreneurial. Lark Toys, after 30 years, is obviously well-loved in the community. But you also get a lot of foot traffic from travelers. Why is that? People come from all over the world because the Mayo Clinic is really close, about a 45-minute drive. People come between their appointments, and they share their incredible, wonderful stories that just take my breath away. We have always tried to make Lark Toys a therapeutic, recreational, have-a-blast kind of place. We have a carousel, a cafe, a mini golf course, llamas to pet—people come and they stay. You mentioned that one of the original toy makers is still with Lark Toys. Tim Monson has been making these toys for 28 years. Originally the Kreofsky family made them themselves, but as they grew, they hired a very young man to help them—Tim. Now he’s a very young grandpa. We also have helpers who make wheels, assemble the toys. What’s the future of Lark Toys? It’s never been our intention to be an extremely big operation, but we do find ourselves making more and more toys every year. We estimate that we get about 100,000 visitors a year. Since our business is retail, we try to make and find the best, most educational and uplifting toys, books, games, and gifts. Underneath and surrounding our choices is a desire to nurture, affirm, welcome, and care for the guests who come to Lark Toys and the staff who help us do it. We realize, increasingly, the gift of being able to create and make toys in our own workshop, and we want to do it with skill and quality and love.